For some, horses are a phase but for others, horses are their life. We are equestrians and pasture grass farmers. Have I mentioned to you I have a black thumb? Some people have green thumbs and are excellent at gardening and growing things. I am convinced I have a black thumb that kills everything. Maybe this has to do with the fact that I would rather nurture a horse than a plant. Needless to say here I am trying to get grass to grow in the new pasture. This is the before picture. This is how the ground looked when we started. The fence is up as noted in the previous post so the horses can’t trample and eat the grass before it has a chance to grow. The next step was to scrape the field level by back dragging the tractor over all of to get the field level and fill in the hoof prints ruts. Then we dragged the field using a pull behind rake. It wasn’t heavy enough at first so we attached a cement block to it. 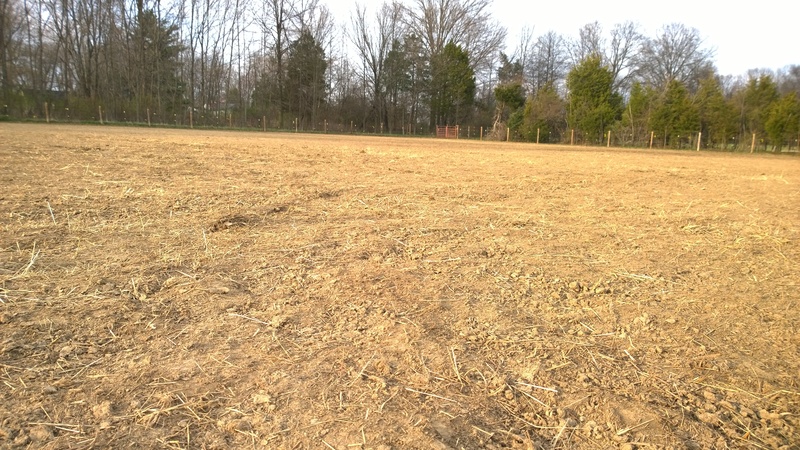 Next we seeded the pastured. We just used the walking broad cast seeder since the areas are not that big. 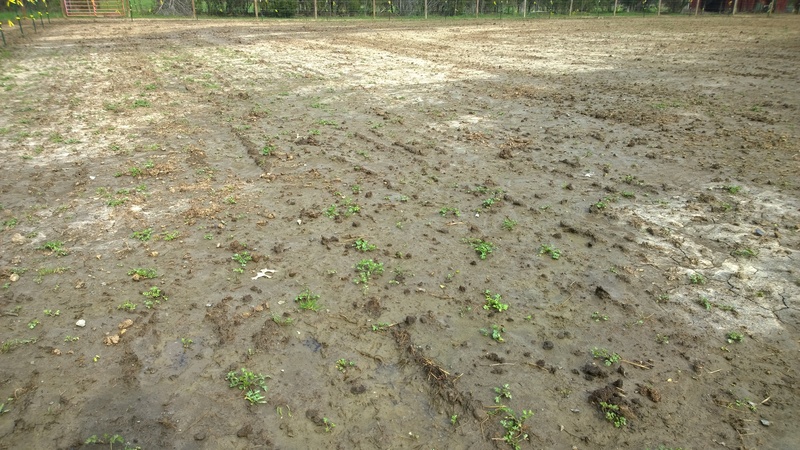 Lastly we covered the field with compost/manure. I figure this would fertilize and driving over the seed would push them into the ground a bit. Ok we are done for the day and can let the horse back in to the ACA. The area around the new pasture. OH wait we forgot to close the gate! What are you guys doing in here? Oh rolling around will help with the seed penetration. Now get out you lot! You are not supposed to be in here! Now we hope for rain to start the germination process. NO NO not 24 hours of straight rain. Did it wash the seeds away? Only time will tell. I am not liking those low laying areas where rain water is still standing. 9 days after seeding let’s see what we have. 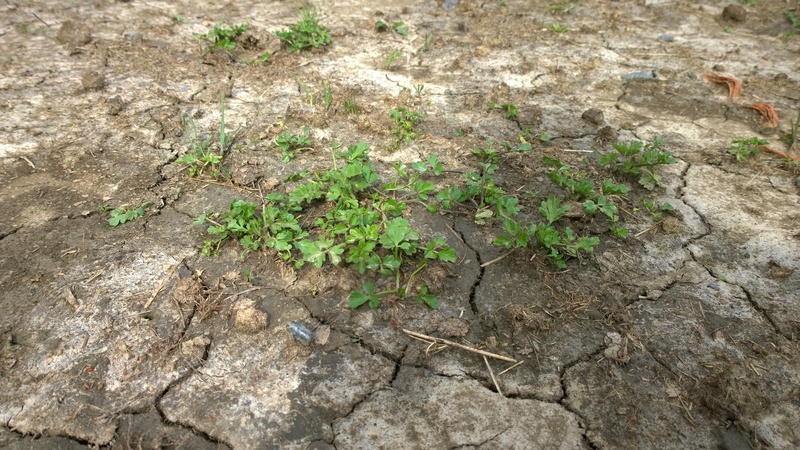 Well the weeds are growing but I do see some blades of grass. Fingers crossed the green grass grows.